Cyclists: Keep seeing ’em. Also, fenders. With the change in the weather Denver is finally experiencing, it seems that many drivers have completely forgotten to look for anything on the road smaller than a pickup truck. On my snowy ride home (the first of the season), there were several drivers who were clearly completely oblivious to my existence, despite flashing lights (however dim they may have been due to the extremely heavy snowfall). Keep your eyes out – though I’m sure most readers of this blog are likely not part of the oblivious-to-cyclists group. 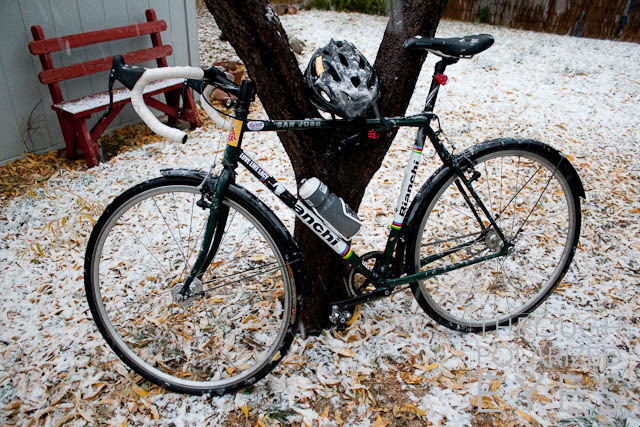 On to fenders: in Denver, fenders are a nice addition to any commuter year-round, but they really shine once winter rolls around. The roads are mind-bogglingly dirty, and going without fenders in the cold/wet/snow is a sure way to end up covered in filth by the time you get where you’re going. I recently replaced a few year-old set of Planet Bike fenders with a new set of Planet Bike fenders on my San Jose, the 45mm-wide Full Hybrid/Road set to be specific. I liked the old ones I had (the front broke after I kicked it for the 1000th time due to toe-overlap), and I love that Planet Bike ships replacement parts simply and inexpensively. The new fenders seem burlier as well, and have come out of the past couple months of use without a scratch. I was wet when I got home, but only because of the snow falling from the sky. Without the fenders, I would’ve been completely soaked, and filthy to boot. Highly recommended. Note the snow caked into the helmet vents.